Pilot Frankie Howard, can do no wrong when he's flying and showing off his daredevil aerobatic skills. On the ground, trouble follows him wherever he goes, especially trouble with women. Frankie adores his best friend's sister, Ruth Ann, and endures her come-ons and rejections in an effort to capture her love. When he finds out she has a new beau, he accepts the defeat until fate steps in and changes their lives forever. Ruth Ann Douglas lives a charmed life as the spoiled daughter of the town pharmacist. She bewitches and teases all the boys, especially her brother's best friend, Frankie. Her dream of becoming an actress takes her to an acting school in Atlanta where she meets Ronald Waters, a young actor. Ronald wants to win her heart, but Ruth Ann can't forget the handsome barnstormer and the small town she tries to leave behind. The overall story of the Barnstormer is a good story, however, it was more explicit and detailed than I expected. Other than that, it was a fine story that I enjoyed. A sweet Historical romance involving a finincky,young woman and a barnstormer turned mechanic and pilot. Taking place in the 30's,the lady is finishing up college as a drama major and has a time making up her mind between the two,young men,in her life. You'll need to read this light,Historical romance to see. Although,not my usual fare,a definite page turner. 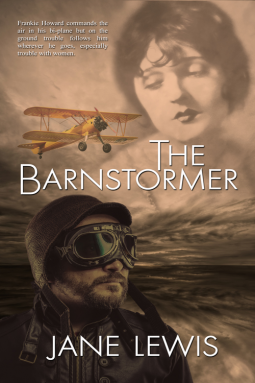 A special thank you,to netgalley and the publishers for allowing me to read and review "The Barnstormer" by Jane Lewis.